The prototype of the military rations of the Chinese People's Liberation Army (PLA) appeared in the period of the War to Resist U.S. Aggression and Aid Korea (1950 – 1953). During the war, the officers and soldiers of the Chinese People's Volunteers (CPV) mainly ate simple solid foods including fried rice, parched flour and fried bean. After that, the logistic supply departments produced a batch of compressed biscuits so as to provide better food support for CPV's tactical operations, forming the earliest prototype of the PLA's standard military rations. The PLA's first-generation military rations in the real sense appeared in 1970s. At that time, the military rations consisted of three staple foods, namely the No. 761 compressed solid food, dehydrated steamed rice and dehydrated noodle, and three auxiliary foods, namely three kinds of canned foods. The No. 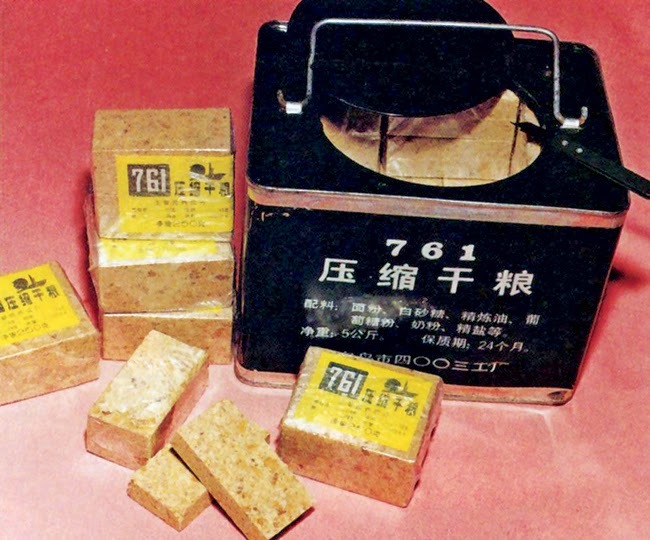 761 compressed solid food was the PLA's first-generation standard personal combat rations. And the PLA soldiers depended on the 761 compressed solid food for energy supplement during a self-defense war in 1979. In 1980s, the PLA's second-generation military rations began to appear, namely using the No. 90 compressed solid food to replace the No. 761 compressed solid food. In addition, the complete-set foods also appeared to make up for the deficiency of the compressed biscuit. During the Battle of LaoShan in the self-defense war in 1979, a kind of soft-package food, which was especially made for the PLA troops patrolling along the plateau borders in China, was provided for the scouting forces. This kind of soft-package food contained three kinds of foods in its plastic bag, namely a bag of meat, vegetable and rice, a bag of compressed solid food and a bag of pear in syrup, and the meat, vegetable and rice can be heated in boiling water before eating. Since 1990s, the PLA logistic supply departments improved the first and second generation military rations. In addition to the personal combat rations, collective food was also developed for a squad or an element. Besides the simple compressed biscuits together with cans and hot pickled mustard tuber, the self-heating food, namely food equipped with a heater, also appeared in the PLA's food menu. 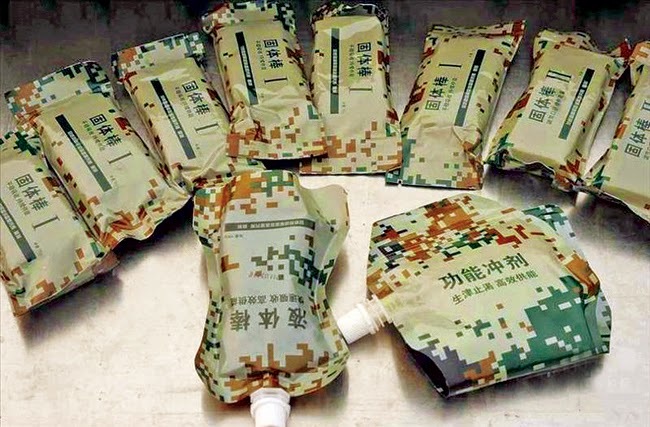 If water was available, the sealed rice and noodles could be heated, marking that the age of PLA's individual combat rations with only compressed biscuits had gone. Currently, the PLA have formed four main categories of military rations, namely field operation food, long voyage food, lifesaving food and general food. The field operation food is the so-called field ration. After the No. 90 compressed solid food, the No. 05 and No. 09 single solder instant foods were successively developed for PLA troops in the 21st century, which contain some additives according to different taste requirements. The long voyage food is classified into long flight food for air-force personnel and long ocean navigation food for naval personnel on surface warships and in submarines. The long flight food is for pilots with a long flight time (over three hours). The most prominent features of the long flight food for pilots are that it can be conveniently and quickly prepared and eaten by pilots with only one hand, and the sealed water bag with a straw for pilots' water drinking is adopted to avoid affecting pilots' flying. During the long ocean navigation, the naval members are apt to suffering serious illnesses including night blindness and sepsis if they cannot get vitamins supplement from vegetables in time. Therefore, the most important thing for long ocean navigation is to meet the military members' nutrition balance requirement. The lifesaving food is mainly used by soldiers waiting for rescuing when in danger, which is mainly distributed to flight personnel and warship personnel. The lifesaving food features high concentration, light weight, high calories and tight package. The general food is the strategic supply for troops in the period of supply difficulty. A large quantity of military cans and dehydrated vegetables belong to this category. In addition, there are anti-radiation food for missile troops and nuclear submarine troops, and plateau anti-hypoxia food.